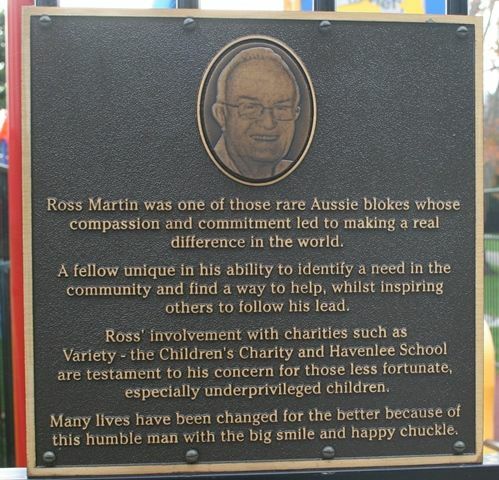 A plaque commemorates Ross Martin for his fundraising work for the Havenlee School and Variety, the children's charity organisation. Ross Martin passed away in 2011 at the age of 72. Ross started Martin’s Auto Electrical, which grew into Martin’s Corner in Bomaderry. He became a charter member of the Bomaderry Lions Club where he held most executive positions, was a zone chairman and deputy district governor and was awarded Lions’ highest accolade for community service the Melvin Jones Award. He took under his wing three charities – Camp Quality, Variety and Havenlee School. His dedication to Havenlee was similar and through his involvement with the Variety Bash helped secure a Sunshine bus, Liberty Swing, Softfall playground and multimedia unit that was named Rosco in his honour. Ross Martin was one of those rare Aussie blokes whose compassion and commitment led to making a real difference in the world. A fellow unique in his ability to identify a need in the community and find a way to help, whilst inspiring others to follow his lead. Ross’ involvement with charities such as Variety – the Children’s Charity and Havenlee School are testament to his concern for those less fortunate, especially underprivileged children. Many lives have been changed for the better because of this humble man with the big smile and happy chuckle.